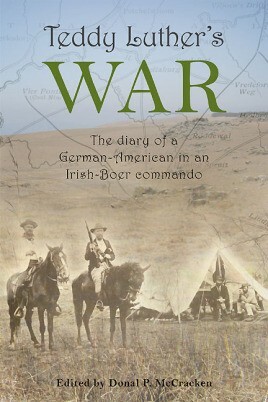 A German-American, in South Africa, fighting the British, in an Irish commando, in the Boer army Some years ago Donal McCracken was working on a book of Ireland and the Anglo–Boer War (1899–1902) when, in the British Ministry of Defence Library, the old War Office Library, off Whitehall, he came upon a slim volume. It was a war diary written by a young German from Halbertstad named Ernest Luther. As a child, Luther went with his mother to New York. From there, in a short period, he fought as a volunteer in three wars: the Graeco–Turkish War, the United States–Spanish War and the Anglo–Boer War. In South Africa Luther joined an Irish commando in the Boer army and fought against the British. Aged around twenty, he was killed in action in September 1900 during the Boer retreat through the Eastern Transvaal (Mpumalanga) in the face of Lord Roberts’s advancing army. So we have a German-American, coming to South Africa to fight against the British, in an Irish commando, in the Boer army. The diary, published in 1900 in English, consists of only 54 small pages, but it is packed with action and invaluable as a source about the Boer retreat as well as about such matters as indiscipline in the commando, drunkenness, use of dum-dum bullets, which Boer leaders were where when, and so forth. But there is also a fascinating postscript. British Military Intelligence took the diary off the dying Luther. Within ten weeks, it had been shipped to London, possibly translated (the original is lost so we do not know if it was written in German), possibly altered and ultimately published by British Military Intelligence at 16 Queen Anne’s Gate. We also know that in at least one instance and probably others, the published diary was handed out to a journalist in the field with General Roberts. So the diary also opens a window into the actions of British Military Intelligence and the embedded journalist within the advancing British army. Donal McCracken was born and educated in Ireland. Having been dean of humanities for many years, he is a senior professor of history in the Centre for Communication, Media and Society at the University of KwaZulu-Natal in Durban. His books include Gardens of Empire: Botanical Institutions of the Victorian British Empire (University of Leicester Press/Cassell), MacBride’s Brigade: Irish Commandos in the Anglo–Boer War (Four Courts Press), Forgotten Protest: Ireland and the Anglo–Boer War (Ulster Heritage Foundation), Saving the Zululand Wilderness: An Early Struggle for Nature Conservation (Jacana) and Inspector Mallon: Buying Irish Patriotism for a Five-Pound Note (Irish Academic Press). He is editor of the series, Southern African–Irish Studies. He is a Fellow of the Royal Historical Society and sometime chair of the Alan Paton Centre and Struggle Archives Advisory Board and of the Durban Botanic Gardens Trust. He is a former Irish universities’ debating champion and South African Genealogist of the Year. Having lived through the worst of the Northern Ireland ‘troubles’ and then witnessed the closing years of the South African struggle against apartheid, Donal McCracken holds strongly to the axiom that people are generally better than their opinions. His interest in war stems not from any fascination with armaments, strategy or perceived heroism but rather from the fact that war creates extraordinary and unique situations where ordinary people must often question and even sacrifice their established norms and certainties. "an interesting publication. This entire book sheds considerable light not only on the frontline irregular soldier, but also on the under-appreciated international dimension of the conflict."